Loving1today: Loving1with Black and White Thinking. They push you away, then pull you back in. You will find these types of behaviors in relationships with those who have BPD. There is a lot of polarized thinking while living with BPD. The sufferer has to be perfect and good, or else they are bad. In their world, there is to be no in between. Even one mistake, no matter how small or trivial, can make a person with BPD feel as if they are a failure and do not deserve to live. When you care for someone who has BPD, this can sometimes be confusing, and hard to deal with. In order to support someone with BPD in becoming more stable in their emotions, help them settle these extreme thoughts and behaviors. It is important to recognize the symptoms and behavioral patterns to find an in between. Instead of giving into the extremes of the black and white thinking, you can help the person with BPD find areas of grey. Understanding, patience, and empathy are needed. You can help guide an emotionally unstable person to a place where they can accept that one mistake doesn’t make them bad. The world is not black or white and good or bad. Therefore, we can appreciate the shades of grey and thus help balance our lives into healthier directions. Support our community member Fee by clicking on the link below to access her book “Her” which illustrates what it is like to live with BPD. Eye contact is well-known social norm. It signals attention, and can communicate a feeling of understanding and honesty. Kristen, who has awoken in a mental health institute after a suicide attempt, misconstrues and abhors eye contact. In the novel Her, by Felicia Johnson, Kristen feels a heavy negative connotation when people look at her, and lashes out at them for “staring” at her. Through her interactions with facility staff and patients, and eventually family and friends, it is found that Kristen suffers from a condition known as Borderline Personality Disorder, or BPD. Recommended for those with BPD or those living with them, Her is a perfect window into the mind of someone with a mood disorder. Although it is eventually the actions of an abusive step father that send Kristen to the point of suicide, it is clear that cumulative damage has been done by her mother over the years. Although not technically seen as abuse, a child forced into responsibility in a single-parent household is trauma in its haziest form. Appeals to support the family, and the sensory odor of threatening coffee breath call up all-to-familiar a memory from my own past and make me sad to realize that the conditions facilitating a BPD diagnosis are all too prevalent and are prone to repeat themselves. For instance, Kristen’s stepfather abused his son because he had himself been abused. The histrionic behavior of Kristen’s mother is exhibited in Kristen herself, but is exaggerated by abusive conditions. This book deals honestly and openly with these hard subjects, and can certainly help a survivor of abuse to come to terms with what happened in an easily digestible manner. Any person would benefit from the anger management and coping skills classes described in depth in the book, and if practiced widely, maybe less abuse would exist in the first place. This is a text version of the magazine article that was printed this month in Up Close & Personal. In the article, I wrote about how my novel was inspired by my dear late friend Holly and my first writing experience. 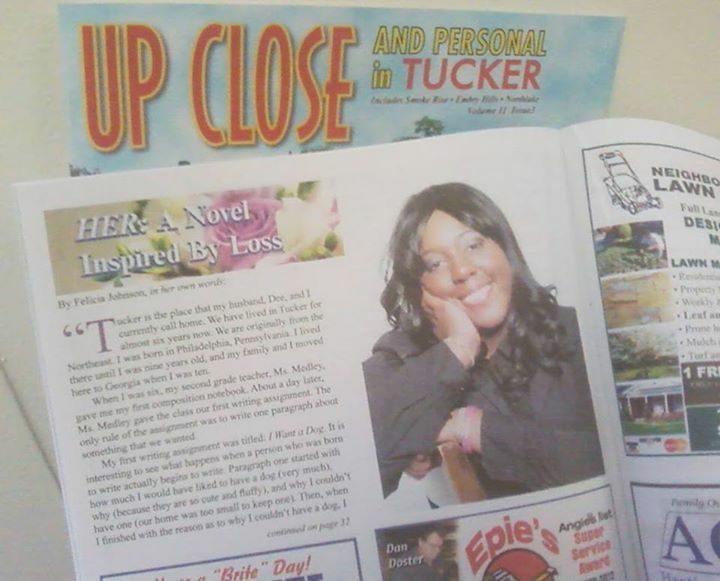 “Tucker is the place my husband, Dee, and I currently call home. We have lived in Tucker for almost six years. We are originally from the Northeast. I was born in Philadelphia, Pennsylvania. I lived there until I was nine years old, and my family and I moved here to Georgia when I was ten. When I was six, my second grade teacher, Ms. Medley, gave me my first composition notebook. About a day later, Ms. Medley gave the class our first writing assignment. The only rule of the assignment was to write one paragraph about something that we wanted. My first writing assignment was titled: I Want A Dog. It is interesting what happens when a person who was born to write actually begins to write. Paragraph one started with how much I would have liked to have a dog (very much), why (because they are are so cute and fluffy), and why I couldn’t have one (our home was too small to keep one). Then, when I finished with the reason as to why I couldn’t have a dog, I began a second paragraph. Paragraph two stated why I should have a dog despite having a small home (I’d take good care of the dog, and let it sleep in my bed). It was only right that the third paragraph listed what kind of dogs I would have, and paragraph four listed different names I would have named my dog. By the time I ran out of pages in my composition notebook, I hadn’t realized that I had written 100 pages. Scared that I’d get in trouble, I showed my mother what I had written. I will never forget Ms. Medley’s encouraging words because those words moved me to keep writing through my adolescent years. Coping with depression through writing saved my life. Writing helped me not to use depression as an excuse not to accomplish my goals in life. Growing up was challenging because I had young parents. I am the oldest of my mother’s four children. My mother was fifteen years old when she became pregnant with me. It wasn’t long after that my little brothers, Barry and Anthony, and little sister, Laura, came along. My mother was a single parent for most of my teenage years. I took on a lot of responsibility, and I helped my mother take care of my brothers and sister. Being forced to grow up fast has its consequences. I developed depression in my adolescent years. Like most children with depression, I was put on medication and saw a therapist to help deal with my depression. However, I found that writing was the best therapy. When I was fifteen years old, I had a best friend named Holly. Holly was diagnosed with Borderline Personality Disorder. I saw the challenges that she and her family faced while she suffered. My friend lost the battle with depression due to BPD. She committed suicide when she was only fifteen years old. I learned, after Holly’s death, that she’d had Borderline Personality Disorder. I didn’t know what BPD was until I did research on it. It was confusing to me at the time. 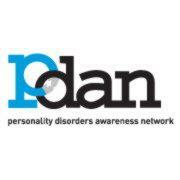 I began to study mental health, depression, and personality disorders. I wrote journals about my memories of Holly, our friendship, and what it was like growing up. Before I realized it, the journal had turned into a novel of great memories. Years after Holly’s death, I had an idea to write a story about a girl who suffered from depression and BPD, but then somehow survived all that she had been through. So, I started on a story, with Holly in mind. Although the story is not about Holly, I wanted to write something that I could dedicate to her. I wasn’t sure where I was going with this story, but I started writing as I did with all of the stories I had written. I wrote the first outline of what the story would be about, and the main characters, but I didn’t quite have an ending for the story. When I wrote the original version of Her, the main character had a different ending than the version that is being published now. I won’t give away the ending, but I will say that I feel like Holly would be proud of the ending that you, as the reader, will read today. If Holly had given herself a chance to be a survivor, I think she would say that this new ending is the ending that she could have had. I dedicate my debut novel, Her, to Holly. Her is not Holly’s story, but she did provide hope and inspiration. I dedicate this story to my dear friend’s memory. Even though the story is not about her, it illustrates the complex illness of Borderline Personality Disorder. Readers – including those suffering from BPD and their friends and family – can glean insight into the mind of a person who has BPD. It is scary and even funny at times. It is a story about strength and survival. Currently, I am studying Clinical Psychology and the subject of Personality Disorders has always stood out for me in my studies and experiences. My husband, Dee, is originally from New York. He came here to attend college back in 2006. College is where we met and fell in love. Always the comic relief, he was the guy who made me laugh the most. It is not surprising to me, and our friends who knew us back in college, that he is a stand-up comedian. Dee performs his comedy in around Atlanta, sometimes at the Laughing Skull Lounge. I can honestly say that my husband taught me how to laugh, love with an open heart, and never give up. Dee encouraged me to continuously pursue my ambition to become a published author. I’m happy to be married to my best friend and number one supporter. He encourages me to write every day.